Despite political fallout from the Gulf oil spill, drilling and oil services companies made big waves in the waning months of 2010. And they're likely to carry that success through 2011 as higher oil prices and political gridlock keep the profits pumping. Baker Hughes Inc. (NYSE: BHI), Halliburton Co. (NYSE: HAL), Helmerich & Payne Inc. (NYSE: HP), and Occidental Petroleum Corp. (NYSE: OXY) are among the oil companies that produced outstanding results in the final three months of 2010. Occidental, the largest onshore crude producer in the continental United States, reported a 29% increase in fourth-quarter profit. Net income climbed to $1.2 billion, or $1.49 a share, from $938 million, or $1.15 a share a year earlier. Much of Occidental's success was related to the company's trading unit, Phibro, which posted a 149% increase in profit. However, the company boosted oil and natural gas production to a record high 753,000 barrels of oil equivalent a day in the quarter – taking advantage of higher oil prices. Oil futures on the New York Mercantile Exchange (NYMEX) rose 12% to average more than $85 a barrel during the October-December period. 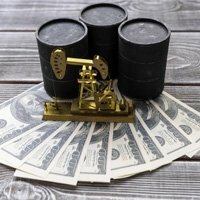 Prices breached $90 a barrel for the first time in two years in December and analysts believe they'll shoot over $100 a barrel by midyear. Helmerich & Payne, another drilling company that operates both on and offshore rigs, also scored big. HP reported a 65% jump in revenue in its fiscal fourth quarter, while profit rose to $104.2 million, or 96 cents a share, from $63.2 million, or 59 cents a share a year earlier. Analysts polled by Thompson Reuters had forecast sales of just $560 million, but the company surprised to the upside with operating revenue of $594.6 million. Many oil services company also topped analysts estimates. Halliburton Co. said net income more than doubled in the fourth quarter. The Houston oil services company reported net income of $605 million, or 66 cents per share, for the three-months ended Dec. 31. That compares with $243 million, or 27 cents per share, a year ago. Revenue increased 40% to $5.2 billion. Meanwhile, profit at Baker Hughes quadrupled, as net income rose to $335 million, or 77 cents a share, from $84 million, or 27 cents a share, the year prior. Baker Hughes "delivered an old-school blow-out," Bill Herbert, an analyst at Simmons & Co. wrote in a note to investors. "We would expect this quarter to result in continued conversion of skeptics into believers." Shares of Helmerich & Payne rose more than 9% following the company's earnings release yesterday (Thursday). Halliburton Co. is up more than 8% since its earnings announcement last week. And Baker Hughes shares are up about 13.5% from where they started the week. And with the price of oil expected to continue its upward trajectory, these stocks still have room to run. "I think the second half, especially the fourth quarter, could surprise us and start showing some strong growth in momentum," said Baker Hughes Chief Executive Officer Chad Deaton. "Given high oil prices and relatively low gas prices, customers are increasing drilling in crude oil and liquids rich natural gas plays where service intensity continues to increase." Many analysts believe oil prices this year will top $100 a barrel for the first time since 2008. In fact, some even believe they'll reach $150 a barrel, topping the record high set nearly three years ago. "I believe we'll be looking at $150-a-barrel oil by mid-summer," says Money Morning Contributing Writer and Editor of the Oil & Energy Investor newsletter Dr. Kent Moors. Rebounding industry, a weaker U.S. dollar and supply constrictions are a few of the reasons why oil prices are set to spike. But the biggest reason is that demand in emerging markets continues to grow wildly. The International Energy Agency (IEA) forecasts global energy demand will rise to 88.2 million barrels per day (bpd) in 2011, up from 86.9 million bpd this year. Most of the new demand will come from China, whose economy expanded by 10.3% in 2010. Oil demand in China is expected to grow 10.4% this year – the fastest rate of any country in the world. "It is hard to overstate the growing importance of China in global energy markets," Fatih Birol, chief economist for the IEA, said in that organization's annual report. "The country's growing need to import fossil fuels to meet its rising domestic demand will have an increasingly large impact on international markets." Birol says that 700 out of every 1,000 people in the United States and 500 out of every 1,000 in Europe own cars today. In China, only 30 out of 1,000 own cars. And Birol thinks that figure could jump to 240 out of every 1,000 by 2035. Furthermore, when Japan hit $5,000 of gross domestic product (GDP) per capita, oil demand grew at a 15% annual rate for the next 10 years, according to oil-industry consultant firm PIRA. The same is true of South Korea. However, China reached the $5,000 GDP per capita mark in 2007, and oil demand has only grown at a 7% compounded annual growth rate. Oil demand is also growing briskly in other economic hot spots around the globe. India consumed nearly 3 million bpd in 2009, making it the fourth-largest consumer of oil in the world. The Energy Information Administration (EIA) expects approximately 100,000 bpd of annual consumption growth through 2011. India has the second-largest proven oil reserve in Asia – behind China – but the EIA expects that subcontinent to become the world's fourth-largest net importer of oil by 2025, behind the United States, China, and Japan. And while global demand continues to rise, political gridlock in the United States has sidelined a potential increase in drilling regulations following last year's oil spill in the Gulf of Mexico. A presidential commission tasked with investigating the Gulf oil spill said the spill was an "overarching failure" of management on the part of BP PLC (NYSE ADR: BP), Halliburton, and Transocean Ltd. (NYSE: RIG). "The Macondo blowout was the product of several individual missteps and oversights by BP, Halliburton and Transocean, which government regulators lacked the authority, the necessary resources and the technical expertise to prevent," said former senator and commission co-chair Bob Graham. The commission called for a total overhaul of drilling regulations, and Democratic lawmakers have pledged to pursue an oil spill bill to address the committee's concerns. "We must ensure that we have systems in place in our government and in the industry so that this cannot happen again," said U.S. Sen. Jeff Bingaman, D-NM, the committee's head Senator. However, Republicans have pushed to resume drilling in the Gulf as quickly as possible, and largely dismissed the panel's findings. "The oil spill was a terrible tragedy, but it should not be used as an excuse to reduce our access to America's resources," said U.S. Rep. Doc Hastings, R-WA. U.S. Rep. Tom McClintock, R-CA, even said the presidential panel was guilty of a "rush to judgment." "You are recommending a whole new level of bureaucracy on top of an obviously already failed bureaucracy with the obvious aim of indefinitely delaying the production of our nation's energy reserves," said McClintock. The panel's recommendations include higher fees on the industry, stabilized funding for federal regulators, more research and development, and increasing the cap on liabilities for oil companies following a spill. But so long as lawmakers remain at odds, any real change in regulations remains implausible. And in the meantime, there will continue to be opportunities for investors to profit. "The oil business is – and in our lifetimes, will always be – wildly profitable," said Money Morning's Moors. "But with crude prices set to skyrocket in the New Year, 2011 will be an especially big profit opportunity for investors." Tom McClintok? Really? He is truly a right wing ideologue. Every article in your email today is severely biased with ultra conservative talking points. It was more than incompetence that caused the gulf oil disaster. There should be prosecutions. The oil companies have done immense damage to the U.S. Beginning with the cost of both wars in Iraq, 9/11 (if you remember, bin Ladin stated emphatically after the attack that the main reason they were so persistent in targeting the WTC was their fury over foreign troops – American – being stationed in Saudi Arabia since the first Iraq war) to the financing of phony science to confuse the issue of climate change, political actions by oil companies have contributed to huge deficit and the U.S. falling behind in alternative energy development, thus losing out on a huge new marketplace. If these costs are added to the price of oil, it is obvious that oil is extremely expensive. It is dishonest to neglect this fact. Alternative energy investment is not a problem. It seems like you do not understand how new technologies enter the market. Necessarily, there is experimentation and there are failures. That's the free market, right? But these costs are negligible compared to the cost of oil. Ultimately the transition must be made and no amount of factual distortions will change that reality. Just as you distort how profitable your pay-for-advice-services are. I have and am still receiving some and have checked you profit claims – they are not correct. I even sent a message to Money Map Press, highlighting some of the most obvious irregularities and never received a reply. There are some gains and some good information but in total, your services are pretty worthless. Lately, nearly everything you have printed is partisan ideology, rather than factual investment info. I will certainly not pay for anymore of your "advice." I can get the same crap by watching the "geniuses" on Fox News. You clearly didn't read this article in full. If you had, you'd have seen that I don't advocate or denounce increased offshore drilling regulations. I merely point out that significant changes to regulation are unlikely to come any time soon, and for that reason – among others – the oil industry will remain profitable. Yes, I quote Republican Repesentative McClintock, but I also quoted U.S. Sen. Jeffery Bingam, a Democrat from New Mexico. That's non-biased journalism. I also take exception to your assertion that every story in today's email was biased toward ultra conservative talking points. That's just plain false. So is your assertion that Germany's stiumulus measures exceeded those of the United States. To be perfectly clear, Money Morning subscribes to NO political ideology be it right or left, conservative or liberal. We are concerned with politics only to the extent that they influence investment opportunities. Our goal is to help people make wiser investment decisions, not pass judgment on their political leanings or espouse our own political or social ideology. The information we offer IS factual, and had you taken the time to read this article you would have seen that. You repeatedly cover all the major talking points of the right wing. If that's what you call factual, I disagree. You are biased, plain and simple. Perhaps you don't realize it because you are immersed in your environment – group think. Perhaps you truly believe in these views. If so I disagree and facts are proving your views incorrect. Like calls for austerity, some lines of thought have been discredited. In the two+ years I've been reading your publications it is becoming increasingly clear that your writers are falling farther behind. They are sounding very old, very 20th century. You should read a couple of comments from other stories today. Some of your readers are spending much more than they should on newsletters, to the point they have little left to invest. It's sad. Factual? It's the interpretation of facts I'm criticizing. Nothing new here. I really did contact, via email, Money Map about claims of profits in their stock tips. I showed evidence through charts. They acknowledged my letter saying they would investigate and get back to me. They never did. I want companies that deal on crude oil we can be supplying product to. We sale Crude Oil,and we want buyers.